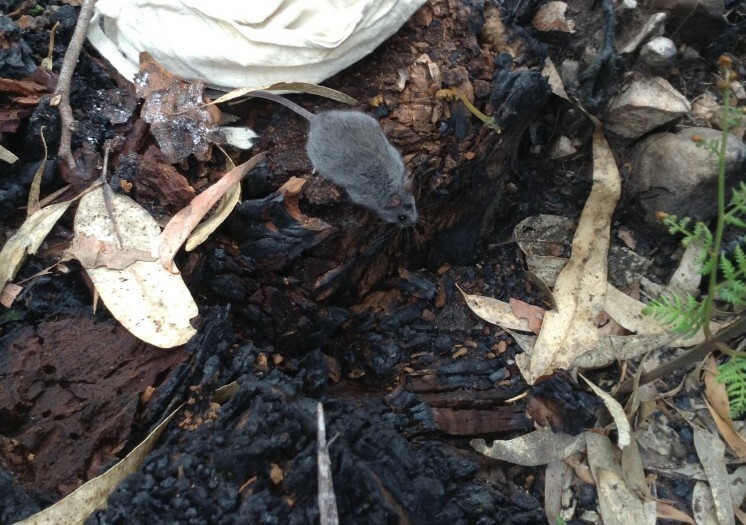 The endangered and elusive smoky mouse (Pseudomys fumeus) is small native Australian rodent species. The nocturnal species nests in communal burrow systems and consumes a varied diet of fungi, invertebrates, seeds and plant material. While many aspects of the species’ life history appear quite flexible – such as diet, habitat, and timing of the breeding season – smoky mice have been poorly detected across much of their range in recent decades and are thought to be in decline. There are several hypothesised causes of decline in smoky mice, most notably drought, foxes, feral cats, and fire – all of which play major roles in the Grampians-Gariwerd National Park. My Masters research focused on a smoky mouse population in the Victoria Range, in the west of the park. In November 2012, as part of a team from Museum Victoria and Parks Victoria we surveyed one of the historical smoky mouse sites in the Victoria Range as part of a broader survey of the Grampians. We detected an astounding 28 individuals at the one site, now affectionately known as ‘Supergully,’ – a record high number in the Victoria Range. 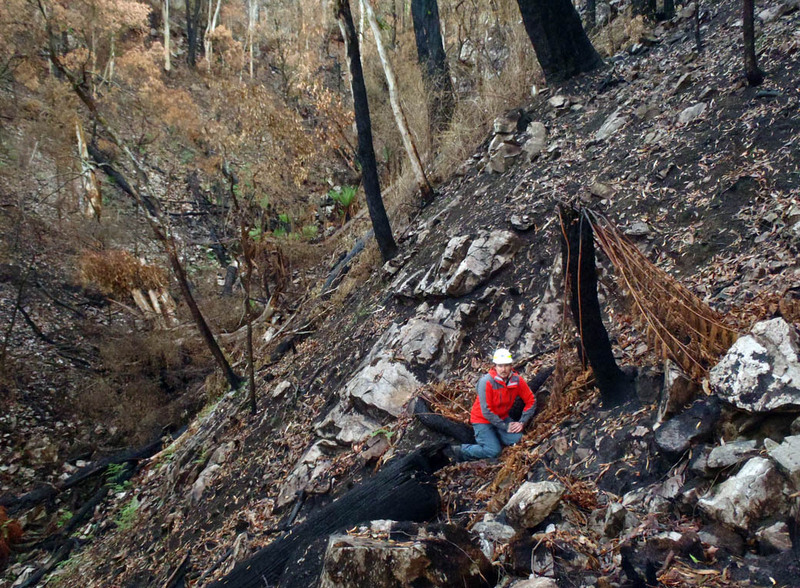 Three months later Supergully burned in the Victoria Valley fire, along with all other historical smoky mouse sites in the Victoria Range. ‘Supergully’ before the Victoria Valley fire, November 2012. Image: Heath Warwick, Museum Victoria. ‘Supergully’ three most after the Victoria Valley fire, May 2013. Image: Heath Warwick, Museum Vitoria. 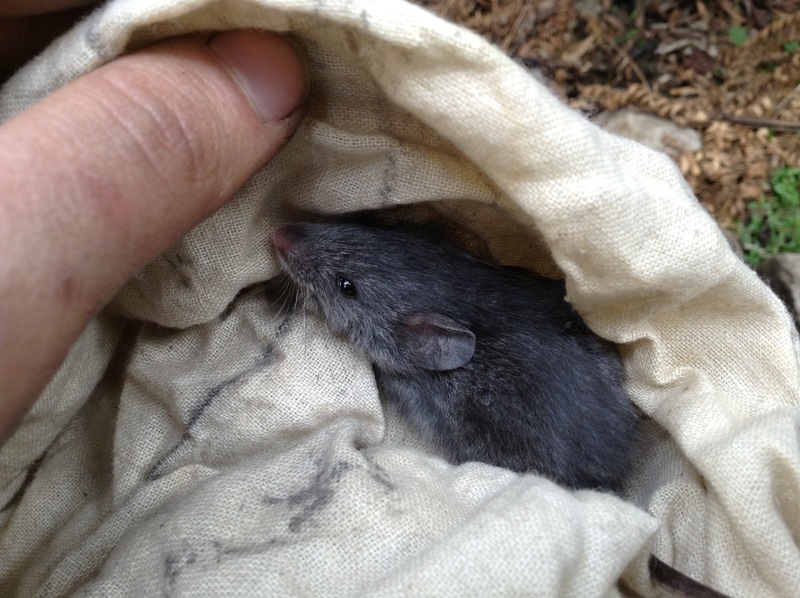 Prior to our research, smoky mice were recorded in the Victoria Range at two sites in 1974 and three sites in 2002-4. To determine whether smoky mice had declined in the Victoria Range since their initial detection in 1974 and how the species responded to the 2013 fire, I surveyed 42 burned and unburned sites across the Victoria Range from September – December 2013. I detected smoky mice at one known site and five new sites, and confirmed their absence from the two 1974 sites. Although I detected individuals at ‘new’ sites, this may be a reflection of previous sampling effort rather than a shift in the species’ occupancy. Contrary to expectation, smoky mice survived the Victoria Valley. Of the six sites at which I detected smoky mice in 2013, five had recently burned. 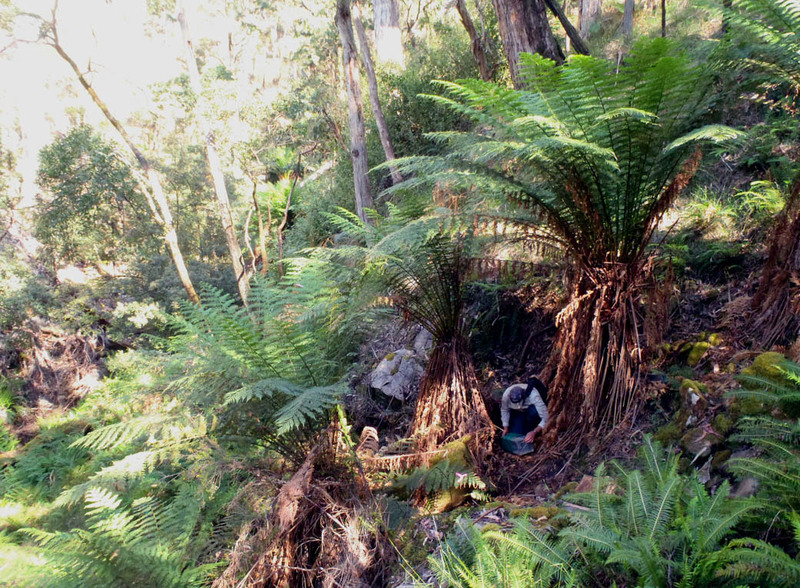 Of nine individuals I captured at Supergully in 2013, three were recaptures from 2012, suggesting the species persisted in situ. All the individuals I captured at burned sites were within a normal weight range and I found evidence of breeding. While this is great news for smoky mice, the species may not respond in the same way to future fires under different weather and habitat conditions. Smoky mice in the Victoria Range have persisted over the past forty years of droughts and feral predators, as well as the short-term impacts of fire. However, for smoky mice and other threatened species, we need to survey populations regularly to keep track of fluctuations in abundance and isolate these from other threatening declines. Fingers crossed we detect some smokies in our survey this November. I think I caught three New Holland mice in my house in Leongatha. There is another one tonight seen. Hi Alan, New Holland Mice tend to avoid people and are unlikely to enter a house, so you’ve probably been catching House Mice (Mus musculus). Do you have any images that I can help to ID?